Sugar Fix Jumps On The Energy Bus! The fall weather has arrived in Chicago, and we are LOVING it! This past week, Dr. Jessica Emery and the Sugar Fix team had their monthly meeting, and we got to discuss our team read, The Energy Bus. Written by Jon Gordon, this book is an excellent read for one who loves a good story how someone goes from a “debby downer” to a human who just looks at the great things in life. 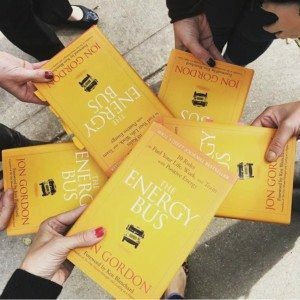 We fell in love with the message that The Energy Bus communicated. This book takes readers on such an inspiring trail that reveals 10 secrets for working through life and work with positivity and thinking that leads to true accomplishment while at work and at home. Everyone faces challenges and every person, organization, company and team will one day need to overcome negativity and will need to define themselves to create their success. No one goes through a perfect life and sometimes the answer is positive energy. Dr. Emery & her team discuss their latest book-of-the-month read! Here at Sugar Fix Dental Loft, we as a team always want to uplift one another and always make sure that our staff knows that we have their back! Everyone has a moment in their life where they feel beaten down and we only hope that we can bring a smile to their face! The same goes for our patients here at The Loft. Celebrating all joys in their lives; be it a birthday, a promotion at work, or even just a “hey you look great today!” We always strive to make the most comfortable and enjoyable experience when they walk through our doors. So remember, jump on that energy bus if you ever feel like you’re going down that road of negativity. It can surely put a smile on your face!